Talking Leadership with Susan Bandes | Blog | Ms. JD | Determined to Rise. Editor's Note: This December, Ms. JD is celebrating the gift of women's leadership with new content about great women leaders and reposting some of our favorites. To learn more about how you can get involved, click here. 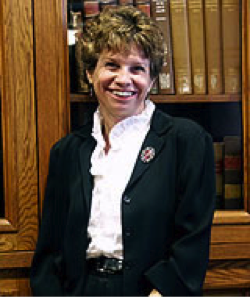 Susan Bandes is a scholar in the areas of federal jurisdiction, criminal procedure and civil rights. She is also a pioneer in the emerging study of the role of emotion in law. Her legal career began in 1976 at the Illinois Office of the State Appellate Defender. In 1980, she became staff counsel for the Illinois A.C.L.U., where she litigated a broad spectrum of civil rights cases, and helped draft and secure passage of the Illinois Freedom of Information Act. She is a Distinguished Research Professor at DePaul. Her recent pro bono activities include acting as co-reporter for the Constitution Project’s bipartisan Death Penalty Initiative, which produced the report Mandatory Justice: Eighteen Reforms to the Death Penalty, and serving on the advisory board to the Chicago Appleseed Fund for Justice’s study of the criminal justice system in Cook County, IL. Hua Wang: What made you decide to go to law school? Susan Bandes: I graduated college in 1973, and it was not common for women to go to law school at that point. I was an English major, but, ironically enough, I did not want to teach. I wanted to get out there and do something that made a difference in the world. There weren’t that many interesting career paths for women. At the time, I was dating someone who was going to law school. I thought, “Well, why can’t I do it too?” I decided to give it a try. You can go to law school without having a very specific idea of what you want to do. You have a lot of options open to you. Everything worked out beautifully for me. HW: What did you do right after law school? SB: I came to Chicago for personal reasons. I did criminal appeals work at the State Appellate Defender’s Office. I represented criminals who had been convicted of serious felonies and couldn’t afford a lawyer on appeal. I did that for four years. It was a wonderful first job because the mentoring was fabulous. It was also an excellent way to learn a lot of substantive criminal law and procedure. After that, I was very fortunate to get the staff counsel position at the ACLU Illinois. I worked on civil rights cases and impact litigation for four years. As much as I enjoyed the satisfaction of having individual clients and helping them with their appeals, it was terrific to lobby, work on class action suits, get injunctions, and do state court legislation. It seemed to be a somewhat more impactful and efficient way of changing the world. I worked with two law professors, Jeff Shaman at DePaul and Ervin Chemerinsky (who is now Dean at UC Irvine). We drafted the Illinois Freedom of Information Act and got it passed. The experience of watching the sausage get made was quite eye-opening. There were an unusual number of compromises. HW: Did you always want to have an impact? SB: I feel very fortunate that I grew up when I did. I was in school at the height of the unrest—Kent State, student strikes, and the Vietnam War. I was in the front lines protesting the draft. Our generation was particularly passionate because a lot of people’s lives were on the line. I do see a difference between then and now. There was a tremendous amount of idealism and a desire to change the world. I was very much a part of that. We felt we could actually do something that mattered. I feel sad that we don’t have the same sense of idealism anymore. It was a real driving force for me and remains one. My family raised me to be very critical and to be angry at injustice. HW: How is academia connected to social change? SB: Academics never seemed attractive to me until I saw that one could still be an academic and be able to be on the front lines and do things that really changed people’s lives. My experience working with two law professors to pass the Illinois Freedom of Information Act really showed me that becoming an academic does not mean you have to stop fighting for what you want. One of the great things about being a law professor is that there are a lot of different ways you can define this job. Now, of course, you have to get tenure, which means you have to publish. Luckily for me, I love to write. The writing, to the extent that it can be read by someone other than law professors, can make a difference. For example, I wrote about the role of empathy in judging during the Sotomeyer and Kagan hearings. My readers include people who are trying to understand what the rule of law is and the role of the judge. It is great to reach such an audience, and to be able to write in a way that isn’t full of legal jargon or so abstract that people can’t understand it. I want to reach out and have a public dialogue. I also wrote about the victim’s rights movement and how it affects the procedure and right of the defendant and the accused. I focus on closure, this idea that is somewhat accepted but not really critiqued—the assumption that a trial should give closure to the family and the victims. The Murder Victims’ Families for Human Rights reached out to me. It is composed of people who have lost someone to murder but who oppose the death penalty. I love working on an abstract level but I also love the idea that people who aren’t legal academics can get something out of my work. HW: What are you most proud of in your career? SB: I am proud that I have been able to balance my career and my family. I will give myself some credit. I am very organized and I work very hard. The flexibility of legal academia has been fabulous, especially when my kids were young. There are places where you have to be at certain times. You want to be there for your classes and for your students, but you can do a lot of the work at crazy hours. I made a lot of compromises in terms of family and work, but I was able to pull it off. HW: Some women make it seem as if it is easy to achieve work-life balance. SB: I don’t know anyone who is able to balance everything. Some women make it seem as if there is no guilt involved. It is not easy! There are always hard choices. HW: The Duke University Women’s Initiative reported on the pressure to achieve “effortless perfection,”—the expectation that you have to be smart, accomplished, fit, beautiful and popular—and that all this would happen without visible effort. SB: That is not helpful. It makes people feel as if they have to achieve an ideal that is unattainable for most people. HW: Do you plan your career and set goals? SB: I don’t quite see it that way. It was more like an evolution and a path. Each step along the way I had a little bit more clarity about what I wanted to do next. When I was a public defender, I wanted to do impact litigation and work on civil rights cases. At the ACLU, I had this insight that it was possible to be both an academic and still make a difference in the world. I had the chance to work with students, and I found for the first time something I hadn’t known about myself. I loved working with students and being involved with the community. I enjoyed mentoring and teaching. I learned how to talk to different groups of people and convey the civil liberty issues in a way that matters to people and that motivates them. When I became a law professor, I wanted to learn more about critical race theory and feminist jurisprudence. I had a sabbatical and I spent six months just reading. It changed my trajectory in terms of what I wanted to write about and how I thought about the law. It ultimately changed the way I teach and led me to the role of emotions in law. I have spent ten years puzzling over it and writing about it. I am really lucky. This is a great job for me. HW: I took an Advanced Negotiations Workshop with Lynn Cohn. We focused on using emotions in negotiations. Tell me more about your interest in emotions and the law. SB: I try to fight the perception that emotion and the law are opposites. Some people wrongly assume that being lawyerlike means not feeling any emotions. These lawyers go into the field without any emotional intelligence. They learn that their law books are not helpful in dealing with relationship issues. It is a really dangerous denial. HW: What is your view on mentors? SB: There are some studies that indicate that it is a lot harder for women to get mentors. The danger is that people mentor those they feel comfortable with, people who belong in their world, people they play golf with, or people they are watching the soccer matches with. Sometimes you have to step outside of your comfort zone to find mentees that you might not necessarily run into. People have to be cognizant because it does impact women. The more women we get in powerful places, the more mentors there will be. We certainly need to be more mindful about mentoring. It doesn’t crop up all by itself. We need an institutionalized structure in place in law schools, in law firms, and in academic settings to ensure that people are getting mentoring. HW: Is there something you wish you had done differently, knowing what you know now? SB: If I was the kind of person who had mapped everything out, I would be able to answer this question. All my decisions, even those that I might have made differently if I had more information, were part of the path that got me to where I am today. People in your generation may be less linear than we were. People tend to look more at life as a series of careers. I don’t think you can know at 23 all the things you are going to do down the road. I work really hard and passionately at everything I do. I think that is why I have had so many opportunities. I also paid attention to things that were important to me. For example, I always knew that I had to write. I wouldn’t be happy if I couldn’t write. At different times I needed different things in terms of my career and family. When I was at the ACLU, I had to work on every Christmas Eve. I am actually Jewish, so it was not a religious holiday for me. But it was family time. That became a symbol for my lack of control over my schedule. I loved the job. It was fabulous. But when you have little kids, you might have to make a choice and decide not to work where you might be on trial for a few weeks at a time. HW: Can you tell me more about your family? SB: My parents were educated and very supportive. They believed that girls should have careers. My mom had a PhD in library science. My dad had a master’s in history. They loved learning and critical thinking. They were always teaching us to question. It was inspirational. I am married to a law professor. Your choice of partner, assuming you want a partner, is pretty crucial. You need someone who will support your goals and make it easier for you to achieve your goals. I have been very fortunate that way. My husband and I both teach at DePaul. The entire time when our kids were growing up, we taught at alternate days. If there was an emergency, someone could be there without having to cancel class. My husband really respects and understands what I do. I couldn’t have this successful balance without him. I have two boys. They are just fabulous. Neither one of them appears to want to be a lawyer. I have taught a number of students in law school who were there for no other reason than that their parents expected them to be. That is such a terrible reason to go to law school. When my sons decided they wanted to do something else, I was extremely proud that they figured out what they wanted and made their own decisions.